Ideal Add to Cart form for bulk or wholesale ordering; customer can order many products at once. This is a must bulk Add to Cart form for any wholesale or parts site! Just purchased this today. Installed it myself quickly and easily with the instructions.. worked straight away... no hassles and will save our customers a stack of time in ordering. We have a wholesale industrial distribution business also. Simple install: Just saved the files and it worked. 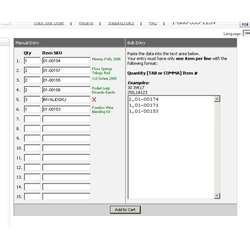 And it was very easy to customize the look of the form using the aspx pages and code-behind files. We are a wholesale distribution company and this is EXACTLY what we were looking for! Highly recommended.